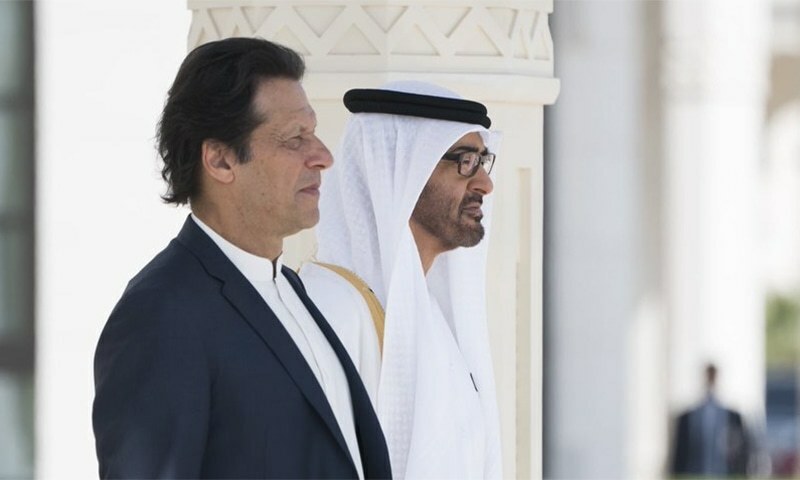 Prime Minister Imran Khan, who is in the United Arab Emirates (UAE) on an official visit, held a meeting with his counterpart Sheikh Mohammed bin Rashid Al Maktoum, read a statement issued by Pakistan Tehreek-e-Insaf. 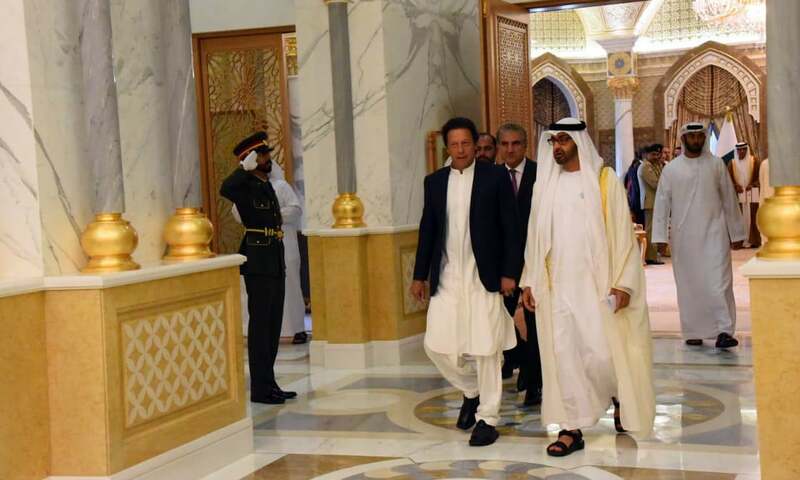 Imran Khan met the ruler of the Emirate of Dubai for the first time after taking oath as the premier. Matters of bilateral interests, and important international and regional issues came under discussion during the meeting. 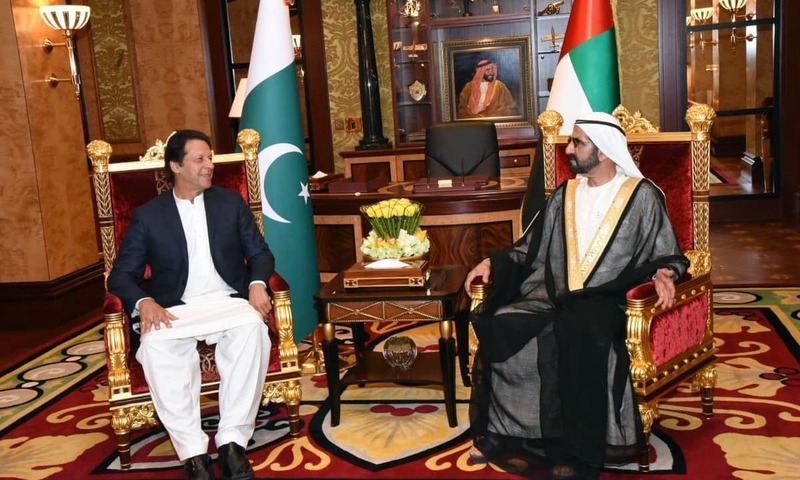 The UAE prime minister issued a statement in Urdu through his official Twitter account to welcome Imran Khan to the Gulf state. “We cherish our rich history of bilateral ties [with Pakistan] based on brotherhood and trade,” the UAE premier said. The prime minister was invited to the UAE by Crown Prince of Abu Dhabi Sheikh Mohammed bin Zayed bin Sultan Al-Nahyan. He travelled there on Sunday on a one-day visit amid reports that the UAE is ready to extend financial assistance to Pakistan. PM Khan was received by the crown prince at an official reception at the Presidential Palace in Abu Dhabi. 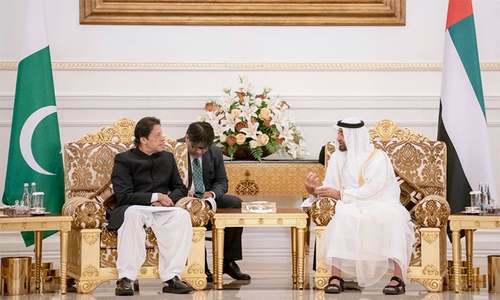 Following the reception, PM Khan and the Pakistani delegation — including Finance Minister Asad Umar, Foreign Minister Shah Mahmood Qureshi and Army Chief Gen Qamar Javed Bajwa — met the Abu Dhabi crown prince and his delegation, and discussed bilateral, regional and global issues of mutual interest. Expressing satisfaction at the positive trajectory of relations, the leaders of the two countries agreed to take immediate measures to further elevate their historic partnership. They resolved to strengthen trade and economic ties and eliminate all impediments to a seamless flow of bilateral trade and investment. According to a joint statement issued after the meeting, the two sides agreed to chalk out a comprehensive roadmap to accelerate cooperation and partnership in areas encompassing trade, investment, economic development, energy, infrastructure and agriculture, with a view to accrue early dividends from the economic partnership. This is the prime minister's second trip to the UAE in as many months. 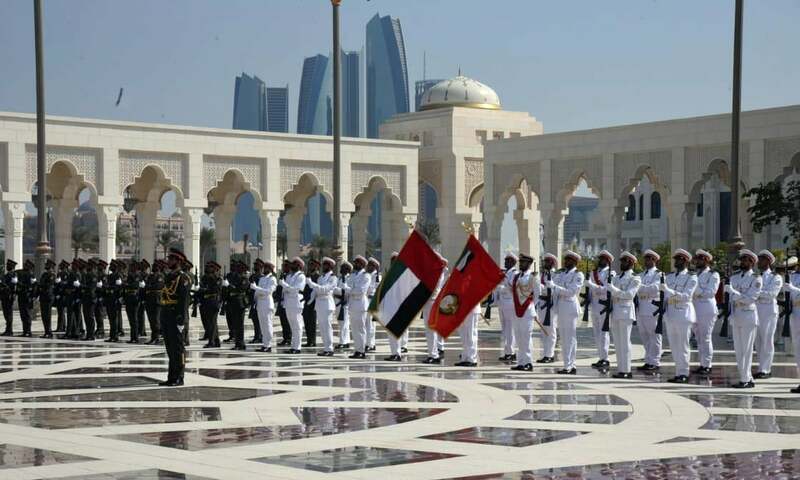 During his last visit to Abu Dhabi on Sept 19, the two countries had agreed to strengthen economic, trade and investment relations. 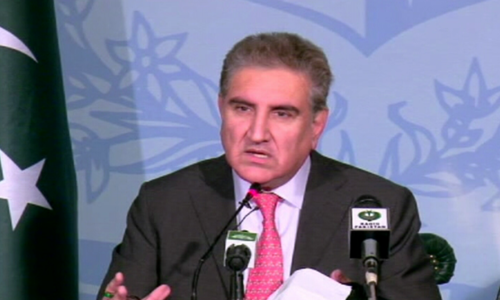 The government had, during a later visit of an Emirati delegation to Islamabad, made a formal request for assistance. The signals from the UAE were positive and the government was hopeful of getting what officials are calling "a good package". Some say it would be comparable with the Saudi bailout of $6 billion — $3bn in balance of payments support and a deferred payment facility on oil imports worth $3bn. The UAE is one of the major oil suppliers to Pakistan. The government has also been in talks with the Chinese government for an assistance package after PM Khan’s visit to Beijing. However, the outcome of the negotiations are still unknown. It is believed that China has asked for more discussion on the matter. Meanwhile, the negotiations with the International Monetary Fund for a loan facility are concluding next week, with Finance Minister Asad Umar optimistic about reaching a basic agreement with the Fund by November 20. Umar had, after the trip to China, announced that the impending balance of payments crisis had been averted after Beijing and Riyadh's pledges of help. Umar has in a TV interview said: "Where we stand today, the current account deficit may total $12-13bn this [fiscal] year." So glad it is raining. Great idea of generate "resource" within one day! Enjoy party! How much is the expectation from here? KSA, China, Abu Dhabi, Malyasia and IMF. Guard of Honor, Red Carpet treatment, all the protocols for only a day visit, shows how much this government is valued in the region. IK will return with an even better news, than he got from KSA. Good job PM Khan. Keep up the good work for Pakistan and ignore your critics. The nation is right behind you. Why some irrelevant members of the team are there? Free trip to Abu Dhabi, I guess. mashallah he is loved all over the world. As per Imrans claim he got big package from China....then why ask another country?? Asking money everywhere and passing that as achievement has become a norm. Common sir, lets get real and start working from basic, don't over hype anything. fingers crossed.. we have to come out of BoP situation at all possible ways and come back stronger than over and have to start the re-building process to secure future of coming generations. Pakistan`s former rulers have virtually ruined its economy primarily by plundering and then by executing non viable projects like orange line. Imran Khan is running around & asking friendly countries for help.Once Pakistan regains financial strength,these loans will be returned.Furthermore, Pakistan needs to strengthen its accountabilty system so as to stop plundering and waste of national resources. Nice to see more neighbours from across the border are 'worried' over this than us! Does "a good package" mean a big loan? Nawaz destroyer relations with most countries which IK is now rebuilding. I think Pakistan will get some good news from UAE too, but what is the chief of army staff doing in this meeting? Some defence related matters perhaps? I'm a Pakistani and I really feel embarrassed! Two trips to UAE in two months. Hope it is a Big package. @Chinpaksaddique, be very careful of Dubai. They are in financial crisis and maybe want a peice of cpec pie. All those commentators who are feeling embarrassed by the trips of an honest PM were missing in action whe Zardari and Nawaz clan was robbing the wealth and land of Pakistan.A note of caution for Imran Khan that all these packages will only help the the nation if a good fiscal discipline is adopted contracts are NOT awarded to cronies and leakage and theft is stopped.Unless economic belt tightening is achieved we will not be able to break the Kashkol. PTI 100 days agenda is completely failed. Better to borrow without interest as interest can be in millions of dollars. Many countries and even some our politicians like to see Pakistan never gets up economically and stay in the financial quagmire that Nawaz Sharif and zardari have created. So, all negative comments and disapprovals are not sincere for Pakistan and for the current government. @Navigator, nothing to be embarrased about. This is what happens when less than one percent of countrys population actually pays income tax. If the nation doesnt want to feel embarrassed, it should start paying the damn taxes. @Navigator, why do you feel ashamed. Care to give another solution to Pakistan financial situation. Countries around the approach other nations for financial help to get back on its feet. Look at Germany after the 2nd world war. Approached Pakistan for a loan. Isn't Imran doing more or less the same as Nawaz around foreign tours? Seeking bailouts and trying to secure more loans? What about the austerity claims? And yet the current government wants to account for the expenditure of foreign tours by the previous governments? Have you asked why NS and AZ got away with stealing and leaving the country bankrupt? PM Imran Khan is getting loans from everywhere. I wonder whether it is sign of strength it weakness. No you are not. Don't pretend! @manjeet, Why do you care ? @ABE, Ejether you’re there for a day, couple of hours or a week, protocols such as red carpet, guard of honor or what have you, are always part of the receiving a PM of a visiting country, Imran Khan is not special in that regard. @akram,: Do you alone represent the entire nation? @Imran, Ever heard of the phrase 'putting your eggs in the same basket'. We'll, Pakistan is trying to avoid that. All those flyovers in Lahore, metros here and there, and motorways came at a cost. The dollar was kept stable for 5 years at the personal behest of Dar, because Sheikh Rashid said something in an interview a few years back, which did massive damage to the export sector. Someone has to pay for it, and if you don't have enough money in your pocket, you have to borrow it from those you know or banks. The alternative for Pakistanis is to start paying their taxes. @Dr Haroon, very well said. Does "deferred payment" not mean another "loan"? @Love Your Country, what was the need for the Army Chief to be there? @Imran, Why NOT we can bring Nawaz or Zardari? Your favorites. PML-N = took everything, left nothing. There is nothing exists named “assistance” in economic terminology. It is either “alms” or “loan”. @Imran, you need to understand the REAL issues facing Pakistan today. We have poverty and illiteracy, empty treasury, unemployment, lack of outside investment.... so, we need to rebuild quickly and need help !!! Do we have any detailed plan in place to pay these back? Approached Pakistan for a loan? World war ii got over in 1945. Pakistan was formed only in 1947. Even at that time Pakistan did have money for itself, leave alone giving loans to other countries. Not all for loans could be an investment's incentive yatra. Is this a long-term strategy? How long will it work? IK blamed NS for borrowing but he himself turned out to be even a bigger borrower than NS. At the end Pakistan is how it used to be, good luck paying all these loans for next coming years. Who would have known that his experience of raising funds from international organization would come so handy in saving Pakistan from a default disaster. Now, i hope he puts real economic changes in place so this situation is never faced by Pakistan again. It has not been made clear if the said financial assistance is going to be a loan or a grant. f these are all loans, then where is the money going to come to pay them back? That is precisely what the IMF is going to ask before making any loans:: "how do you propose to pay it back?" All the best PM Imran Khan and people of Pakistan. @Wow, world war 2 ended in 1945 when Pakistan didn't even exist . So how did Germany approach force loan? @Ahmed, us. Deferred payment means a loan on which repayment will start a bit later, staggered. But the payment will, obviously, be interest, not the principal. UAE is allowing a short breathing space nothing else. Discussed bilateral, regional, international and global issues! Besides local issue of financial aid, do we have any issue? @Dr.M.S.Awan, Former rulers to blame for current problem and these new loans from IK will be great gift for future rulers. @hussain, To keep IK in line. Middle east needs security,.....we can provide but there is price ofcourse. Whenever a rich friendly country invites us we cheer and celebrate. 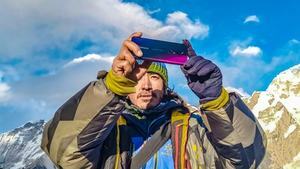 The world should see how optimists we are rather than pessimists. How happy are people of Pakistan just for getting loans. @manjeet, don't worry your expectations will not realize. @Zaheer, first secure own country before providing other. @Zaynab Khan mirani, "another loan? and we are celebrating" Most probably because people think that this loan is not meant to fill the PM's offshore accounts or buy flats in London!!! Very nice way to welcome the Prime Minister of Pakistan. Encourage them to invest in Pakistan. The product generated by that investment may create demand for Pakistani products in the Middle East.This way both parties will gain. @AMJAD KHAN, Good observation and comment. Personally if I am taking any kind of loan I feel pressure of repayment of that loan along with interest. But in Pakistan people are happy to get loan like that is free . @Dr.M.S.Awan, - Does Pakistan have any plans to return the loans ? You need a roadmap for returning loans. Else you are just postponing the problems for the next government- five years from now. Khan knows that getting a few loans will be good enough for him to tide over his 5 years. @Jamil khan, My expectation is a happy and prosperous Pakistan able to manage without loans. wow, now we can give loans to loans to poor countries with this money. @Wow, East Germany or west Germany? Did Pakistan help? Whom did they approach as Pak was never existed when 2nd world war ended? Dubai itself reeling n debt. Businesses are collapsing. Latest s ABRAAJ. What loan they will they give hm. @Vijay, WOW, brilliant analysis, hope you didn't have to spend a lot of time coming up with your findings. @Dr Haroon, You read between the lines. An honest PM fighting for country's honour. We already secured $ 6 Bn from SA, $ 6 Bn from China and 6 Bn from UAE. Turkey and Russia visit next will raise more than $ 30 Bn+ .... as promised, we need not go to IMF. These are great news for the country and very bad news for the critics (as achieved within 100 days of PTI Govt.)! Assistance is a sugarcoated word to make feel better. where is the cash and how much from emirates? It is so good to see so many countries willing to give us financial packages. It shows there must be something very good about Pakistan - otherwise so many countries would not be willing to give us such financial packages. We now know who our real friends are. @Hwh, “ Great idea of generate "resource" within one day! Enjoy party!” No need for any worries. We can live on packages. @BAXAR, Doesn’t IK have a nice flat in London?